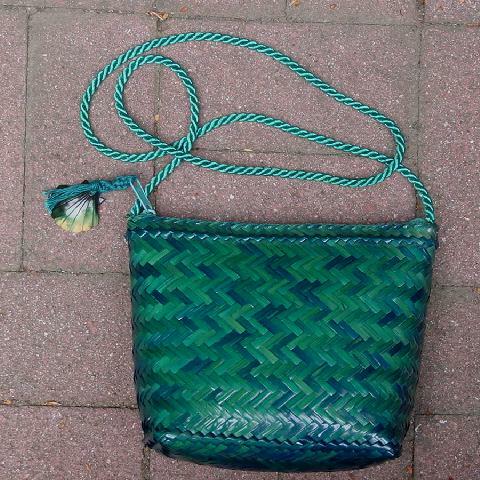 This basket weave straw purse was made in the Philippines by Vanessa, Exclusively for Fashion Imports. It's in teal and various shades of blue and green. 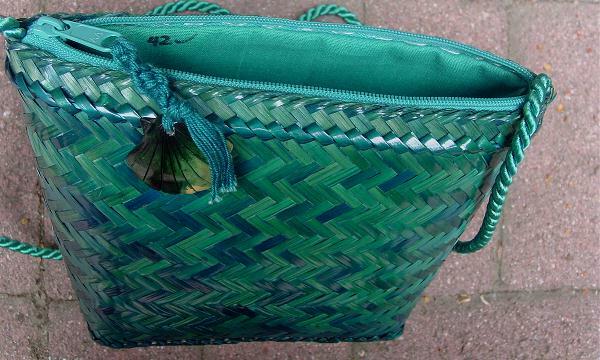 It has a teal green fabric lining with an interior small zippered pocket. There is a black 42 and check mark on the lining opposite the pocket side (the stylist marked the purse for inventory used). There is a top side to side zippered opening. It has a 43 1/2" long by 1/4" wide teal cord shoulder strap (20 3/4" drop). The zipper pull has a braided cord pull and plasticized shell shaped ornament with detailing on one side in greens and pale creamy sand-bone. Because of its color, it can be worn from daytime into evening. It's from a stylist's inventory, and was worn once, in a magazine photo shoot.